BlytheLife.com » Could I ever be a one-Blythe girl? 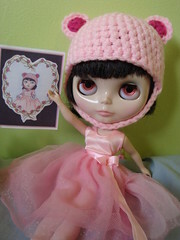 I’ve thought about what it would mean to be a one-Blythe kind of girl. It would mean downsizing. It would mean selling my dolls and sending them off to new homes. It would also mean that there would be one doll to spoil, one doll to have all the clothes and shoes and accessories. But at the same time, I know I’m capable of downsizing – but do I want to? After a lot of thought (and maybe a twinge or two of guilt over having so much money in dolls – especially after buying a Kenner), I’ve really decided that I’m probably not able to be a one-Blythe girl. At least not right now. At seven Blythes, two of them were gifts, the rest were grail dolls. And they’re still dream dolls that I don’t think I could ever let go of. There is a reason why I was attracted to them in the first place and those feelings have not faded since the dolls have arrived in my grabby-grabby hands. If nothing else, they’ve intensified. I feel horrible with the idea of selling gifts, especially since my Punkaholic People (Eden Mouse) has become one of my favourites (but it’s also hard to not have them all be favourites when I have a relatively small dolly family). And then Tertiary Jane (Simply Peppermint) was also a gift and she’s just darling. She had the best hair out-of-box out of any of my girls and she’s got that yummy mint hair that makes me smile. When I do look at my dolls, I get a happy feeling inside. And since I’ve only had a slight twinge over feeling bad about how much money is ‘locked’ up in dolls, I think I’m still okay. As long as no emergencies come up where I need a sudden cash influx anytime soon, I think I’ll be perfectly content with the dolls that I have right now without needing to add any new additions for a while (or doing any major subtractions). I do sometimes wish I could be a one-Blythe hobbyist. Some people have families of under five or even just a dolly family of one. That one doll gets all the attention, gets completely spoiled (because there’s no competition) and there’s no choosing necessary to figure out who’s getting their photograph taken today. I think that’s a nice feeling, not having to choose or play favourites. I just don’t think I’m capable of downsizing right now and I’m pretty okay with that. Could you ever have just one Blythe or a very small dolly family? QOTW: Do you play favourites? QOTW: Troubles with naming a new girl? I was a one-Blythe person, for one year, I only have 4 Blythes (but many other collection dolls – not really expensive ones), but like you all of them were chosen for a strong reason, although only one grail Blythe. I don’t want to have a big collection, I don’t *love* all Blythe models, and only have 4 dolls on my wishlist, so, I guess I can manage to keep it under 10 dolls for a long while. Doubt it. I wasn’t one of those “one in the mail, another already on her way too” collectors, but I had my second girl in two months, another one three months later (bday) and then a Christmas girl two months later…I’m also now at seven. The only one I could even THINK of selling was my Christmas present doll. It just makes me so sad to think of selling her, and really, what would the 100.00 or so do for me? It wouldn’t be worth it in my mind. I don’t think I could exist with just one…and I could never, EVER sell down the girls that I have. Two are MY customs, one is my first, one is my Mondie, and the other my Azzie, and then there is my EBL, Lilah, who is a sweetheart too…augh! You see why I’m at seven and climbing, not decreasing! Haha. I “only” have 3, and they are all recent releases (Simply Mango, Very Vicky and Nicky Lad.) I got Mango because I saw her in a shop (I live in San Francisco and there is 1 place that sells them, Double Punch) and I wanted a Blythe for a long time so I just slurged on her. I like her a lot but I don’t love her as much and my 2 other girls Nicky Lad is my lookalike and Very Vicky looks like my sister so I just wanted the pair. Sometimes I wish I had a dark haired girl or Miss Sally Rice who is my dream dream dream girl. I don’t think I will get anymore though, I’m at the point where I really like their set up, I also have 1 Dal and 1 Toysfield Kuma so I have 5 “toys” and I think they are all just perfect. I knit and crochet them stuff and try to sew.